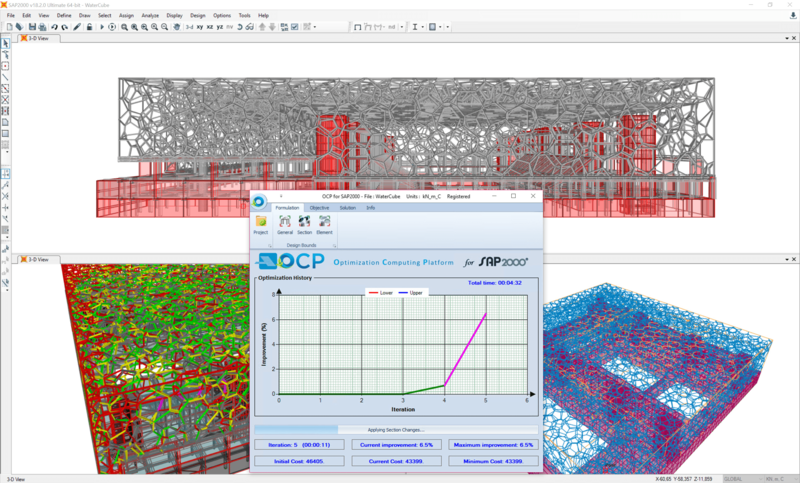 ACE OCP is a plugin for the CSi products (SAP2000® and ETABS®), representing an advanced real-world optimum design computing platform for civil structural systems. In order to be applicable in the everyday practice, it is implemented within an innovative computing framework, founded on the current state of the art of optimization. It covers all construction materials that CSi products support such as reinforced concrete, steel, aluminium etc. 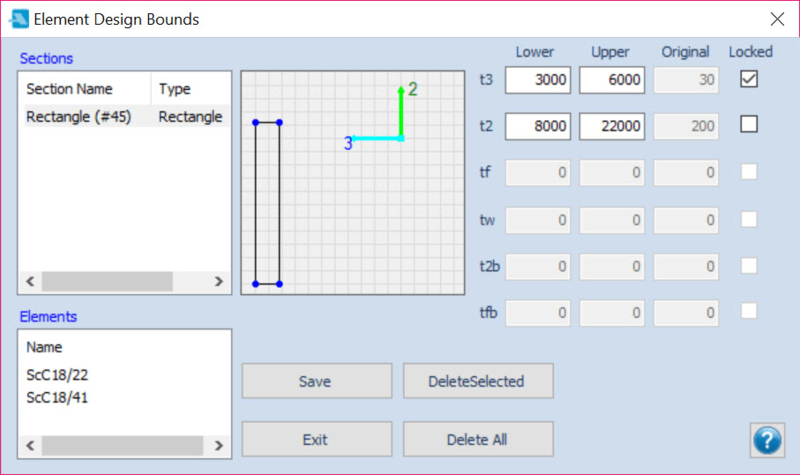 Advanced and easy to use interface, based on the windows ribbon framework, makes structural optimization a single-click process. 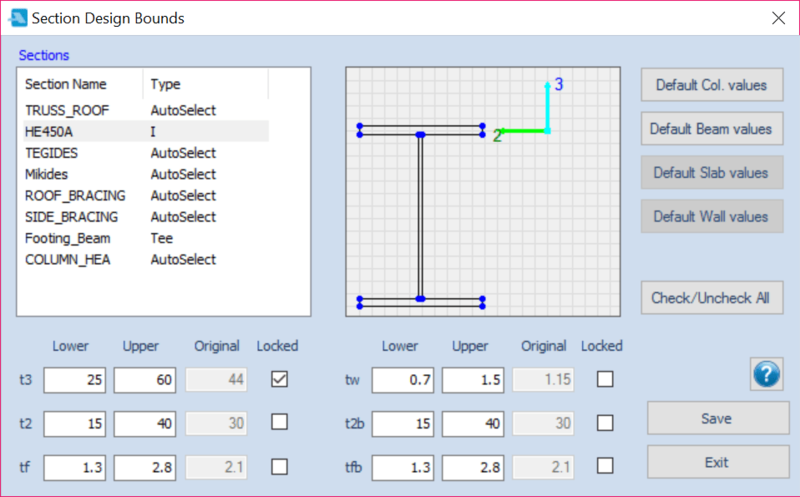 Numerous customizable options; among others to define the design bounds of the design variables, either at section or element level. Based on the most powerful, state of the art, numerical optimization algorithms. Optimization is the act of obtaining the best result under given circumstances. In design, construction, and maintenance of any engineering system, engineers have to take many technological and managerial decisions at several stages. The ultimate goal of all such decisions is either to minimize the effort required or to maximize the desired benefit. 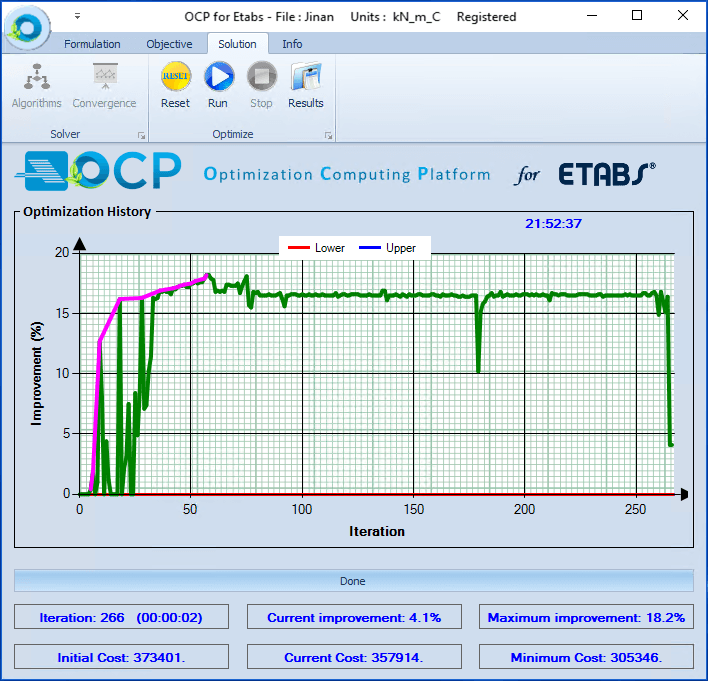 Among others, using ACE OCP, material cost reduction can be achieved. 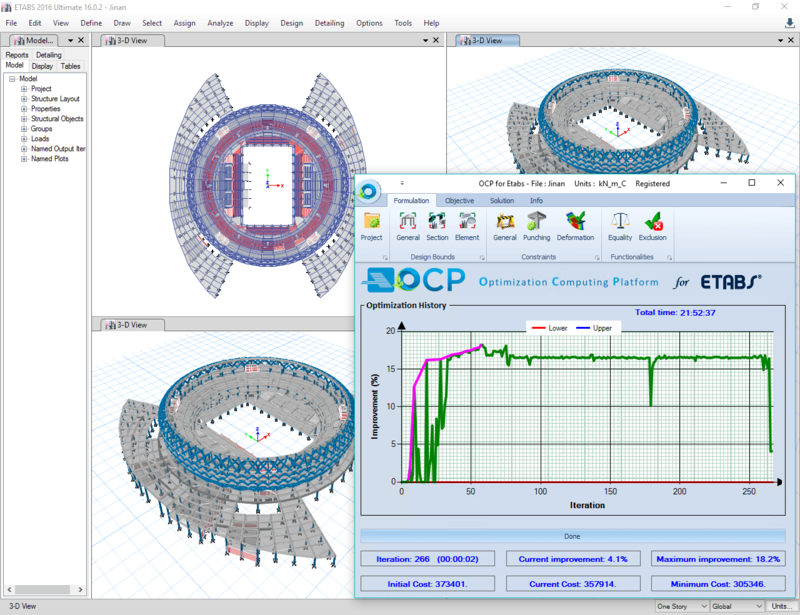 The scientific and technical opportunities adopting ACE OCP plugin in the design practice are enormous, but so are the issues at stake. The main goal for the implementation of ACE OCP plugin is to help new generations of engineers to design safer and economic structures within an affordable and reliable technological framework. In the past, various numerical optimization algorithms have been presented aiming to meet the demands of structural design optimization. State-of-the-art optimization algorithms are available in this innovative CSi plugin all of which have been successfully tested in various challenging problems. Within the construction industry, there is constant pressure to deliver projects more effectively on multiple fronts. This is most notable in the desire to reduce project time scales, while also consistently increasing capability and design quality. ACE OCP brings significant added value to the users of SAP2000® and ETABS® and an instant payback. 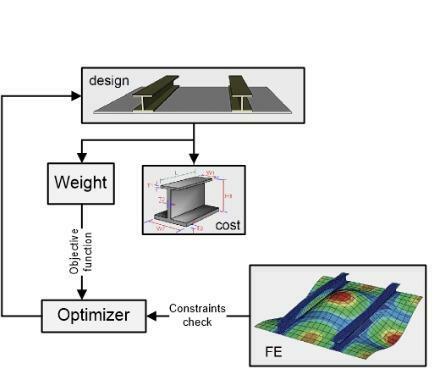 (iv) efficient optimization algorithm for achieving optimized designs that satisfy both design requirements and economic, manufacturability or performance criteria. ACE OCP harnesses technology to drive efficiency, increase performance and reduce cost while preserving safety excellence. ACE OCP is the result of over 20-years of Research and Development including practical experience in developing a general-purpose code for structural analysis and design optimization in the form of a modular standalone code, incorporating key contributions from the prestigious Institute of Structural Analysis and Antiseismic Research of National Technical University of Athens (NTUA).
. 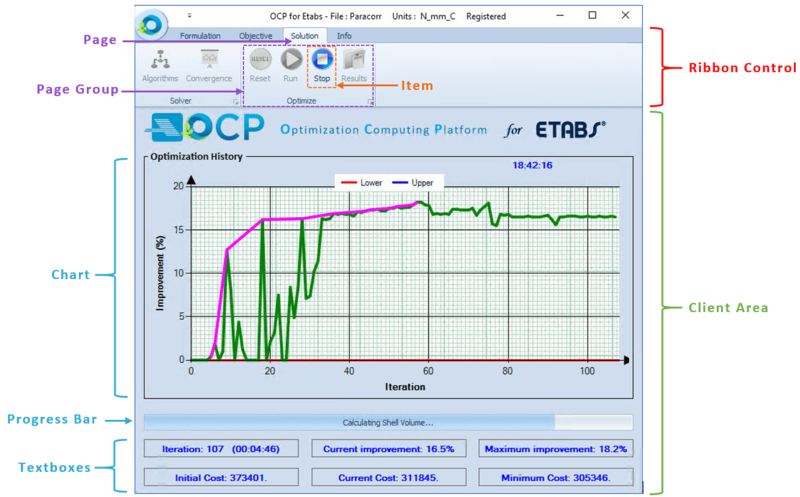 The methodologies integrated into ACE OCP plugin have been approved with the publication of the theoretical framework and indicative results in the official Journal of the International Society for Structural and Multidisciplinary Optimization (ISSMO). Three-dimensional structure of structural steel and reinforced concrete material composed of a steel space frame, in the form of the ‘cube’ with bubbles and a shera wall structural system in the lower elevations. It is a structural model of the Beijing National Aquatics Center, also known as the Water Cube. The structure consists of 24,905 frame elements and 8,653 surface finite elements. d) 13 groups with one design variable of surface finite elements (one group of slabs and 12 groups of shear walls). Three-dimensional structure of structural steel and reinforced concrete material. It is a structural model of the Jinan Olympic Sports Centre that consists of 10,555 frame finite elements and 2,871 surface finite elements. Regarding the formulation of the optimization problem, a number of groups with cross-sections were defined; 7 groups with two design variables of concrete frame elements, 7 groups with one design variable of steel frame elements and 5 groups of surface finite elements (3 groups of slabs and 2 groups of shear walls). ACE OCP is not a standalone product! You need to have a valid and working license of CSI’s SAP 2000 v18, SAP 2000 v19 or ETABS 2000 – 64-bit version ONLY. There are different ACE OCP versions for each of the versions mentioned above. If you have 32-bit version of SAP2000 or ETABS installed you can download from CSI the 64-bit version. For copy protection and licensing reasons an always-on internet connection is required when running ACE OCP!